The final installment of the U.N.'s top climate report, which calls for prompt, extensive action to avoid calamitous impacts from climate change, garnered relatively little attention from the major print, cable and broadcast media outlets compared to the first installment. 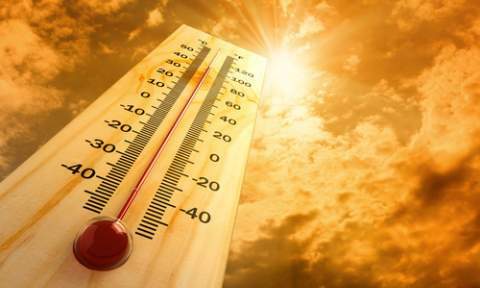 Although shocking, catastrophic, and large-scale representations of the impacts of climate change may well act as an initial hook for people's attention and concern, they do not motivate a sense of personal engagement with the issue and indeed may act to trigger barriers to engagement such as denial. 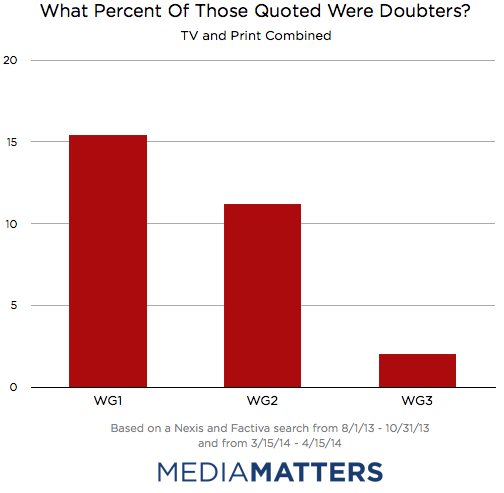 Doubters Were Not Given As Much Airtime In Final Installment As In Previous Reports. 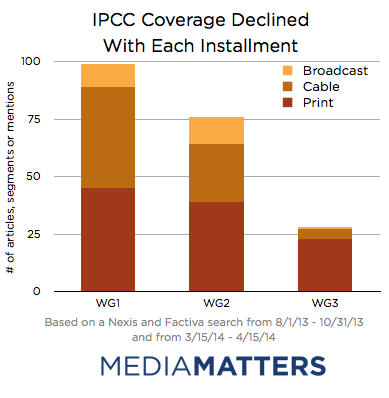 Although media coverage declined for each installment of the IPCC report, it improved in one measure of quality -- the rate of climate "skeptics" and doubters quoted also declined with each. In the third report, the only coverage that quoted someone classified as a climate doubter for our study was a Washington Post article, which quoted Senator James Inhofe (R-OK) without rebutting his attempt to cast doubt on climate science. In covering the second report, the Wall Street Journal and USA TODAY published op-eds by climate doubters, and the Associated Press quoted David Kreutzer of the Heritage Foundation who has cast doubt on the climate consensus. METHODOLOGY: We searched Nexis and Factiva for "panel on climate change" from August 1, 2013 through October 1, 2013 and from March 15 to April 15 for ABC, CBS, NBC, CNN, MSNBC, Fox News, The New York Times, The Washington Post, The Associated Press, Reuters, Los Angeles Times, USA TODAY and The Wall Street Journal. 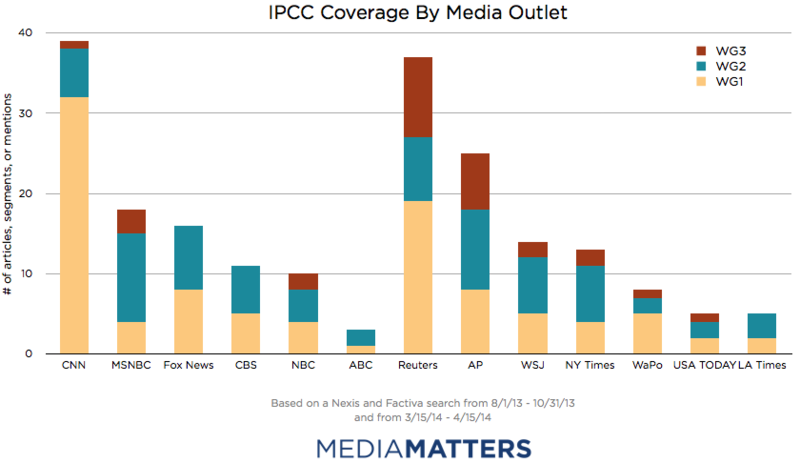 For TV outlets, we did an additional Nexis and Factiva search for "climate change." We also searched an internal video archive for "climate change" for Fox News and MSNBC daytime shows, which are not included in Nexis. Our analysis included any article, op-ed, editorial or segment devoted to the latest IPCC report, as well as any mention longer than one sentence. We only counted those quoted who commented on climate change in the context of the IPCC report. Guests were included as "doubters" if they cast doubt on whether the majority of recent warming is manmade, self-identify as a "skeptic," or stated that the benefits of warming would outweigh the costs without explicitly mentioning that at some point the costs would outweigh any benefits. We treated authors of bylined op-eds as figures quoted, but did not include editorial boards in this count. Shauna Theel contributed to this report.